Stinging nettle is a bushy, pointy plant that has stinging hairs which function as needles to unwary passersby, injecting histamine that can feel like a bee sting, thus its odd name. It can grow to seven feet tall making its ability to inflict herbaceous stings much easier. Stinging nettle uses in medicine are slightly less unpleasant and include everything from joint relief to constipation relief. There is little scientific evidence to support the use of stinging nettle root in many popular medical applications, however that has not prevented users from persisting that urtica dioica can help a body more than it can sting it! One of the most common uses of stinging nettle is its use in aiding urination issues that result from an enlarged prostate. Stinging nettle treatment is said to reduce nighttime urination along with a frequency to go and also pain while urinating and the inability to do so. On a related note, stinging nettle root has also been used as a diuretic and as a treatment for UTI’s and even for kidney stones. The astringent properties of stinging nettle root have made it a popular wound cleaner amongst the natural healing community and it is also used externally for muscle aches, a scalp that is oily and even for hair loss. In fact, it’s frequently used in many cosmetic products including hair care and skin care. Stinging nettle side effects are normally infrequent and mild. Some users have reported gastrointestinal ails and an increase in sweating. Of course, medicinal purposes aside, touching the fierce plant can of course lead to skin irritation, an external side effect of this plan. 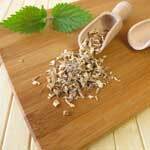 The use of stinging nettle root in pregnant women has been deemed as unsafe. This is because it is believed to be able to cause uterine contractions that could potentially lead to a miscarriage. Breast feeding is also an unsafe time to use stinging nettle. If you are diabetic or have high blood sugar, it is best to avoid stinging nettle altogether, as it is possible that it can interfere with these and other health conditions. If you are considering using stinging nettle in any form, it’s best to speak to a health care provider first to ensure that it is safe for you to use.